When the Czech biologist Vítĕslav Orel wanted to discuss his work, he knew better than to do so in his office or on the telephone. Instead, he would go out onto a busy street where it was far less likely that he would be overheard by the secret police whom he had strong suspicions were eavesdropping on him. As a scientist in Cold War Czechoslovakia, it was not only Orel’s contact with Western scientists that had attracted the interest of the state security service, but also the actual nature of his work. For Orel had dedicated his career to honouring the life and work of Gregor Mendel, the 19th century Augustinian abbot whose experiments on pea plants carried out in the garden at the St. Thomas monastery in Brünn (now Brno) would, a century later, become hailed as a landmark in biology. Yet for a scientist in the Communist Bloc expressing support for Mendel could be a dangerous stance to take. Whether Mendel and the discovery of his ratios can truly be said to be the origin of modern genetics has been the subject of much ongoing debate amongst historians of science, but for scientists in the Eastern bloc during the years of the Cold War, the interpretation of Mendel and his work had serious implications. Whilst Mendel was revered in the West as the founding father of genetics, on the other side of the Iron Curtain, his name had become so infamous that in 1950 a statue of him that had been unveiled forty years earlier by the English biologist and champion of Mendel’s work, William Bateson, was removed in the middle of the night by a group of Czech soldiers and placed in an obscure corner of the monastery. How had an unassuming 19th century monk and his experiments with peas become so controversial? The answer was thanks in no small part to the efforts of a Soviet scientist called Trofim Lysenko. That Lysenko had humble roots as the son of a Ukrainian peasant farmer probably endeared him to the ruling Communist authorities and helped his steady rise to power. The Communist Party felt that in Lysenko it had found a true proletarian hero who could challenge what they felt to be the bourgeouis elites that practised science in the West. Lysenko’s rise to power had begun whilst he was working at an agricultural station in what is now Azerbajan where he had shown that artificially chilling seeds of wheat appeared to alter their growth process. By this treatment, known as vernalisation, strains of wheat that needed normally to be sown in winter in order to germinate and grow the following spring could now be sown directly in the spring thus avoiding the danger that a very harsh winter might kill them. Vernalisation was reported in the press with great excitement. The Soviet Union considered itself to be the first scientifically organised society and one of the main criteria by which it evaluated science was whether it was practically oriented. Lysenko’s work on wheat met this criterion perfectly – for while the geneticists of the West were perceived as wasting their time doing self-indulgent experiments into such esoteric subjects as eye colour in the fruit fly Drosophila, Lysenko’s work on vernalisation seemed to promise an agricultural revolution on a massive scale that would demonstrate the superiority of Soviet science. But it also promised far more. Karl Marx had once declared that the job of philosophers was not simply to interpret the world but to change it, and now it seemed that Lysenko had extended Marx’s dictum to biology. Lysenko’s main opposition to Mendelian genetics was that it implied a rigid biological determinism in which nature could not be deliberately manipulated and in an address at the fourth annual session of the Lenin All Union Academy of Agricultural Science held in 1936, he challenged Mendelism declaring ‘We deny corpuscles, molecules of some special “substance of heredity”’. Thanks to an ascent which had been achieved not so much by publishing in peer reviewed academic journals but rather by skilled manipulation of the press and political machinery, Lysenko became President of the prestigious Lenin Academy. Yet now that he was the most eminent biological scientist in the Soviet Union he was no longer content to denounce genetics, but also those who practiced it – and by the time that Lysenko gave an address to the Lenin Academy in August 1948 denouncing genetics, Mendel and his supporters had a yet another charge against them. Thanks to the way in which Mendelian concepts of dominant and recessive traits had been adopted by the Nazis to justify their ideas of racial dominance, geneticists were denounced not just as lackeys of the West, but also as supporters of eugenics and fascism. Following Lysenko’s address, Stalin approved a vigorous and oppressive campaign to silence scientists with sympathies towards Mendel. Libraries were cleared of journals that promoted Mendel while scientists who had endorsed Mendelian views were dismissed from their posts and even faced imprisonment. One such victim was Jaroslav Kříženecký, a Czech biologist who worked in Brno, and in the aftermath of World War II, had hoped to establish a museum there as a tribute to Mendel. In 1949, however, Kříženecký was dismissed from his post at the Agricultural University in Brno for rejecting Lysenko’s teaching and nine years later, following a fabricated trial he was imprisoned for the crime of having promoted genetics. Sadly Kříženecký never lived to see his vision of a establishing a museum for Mendel become a reality. He died in 1964 following several years of ill health after the 18 months that he had served in prison. But thanks to one of his former students, Viteslav Orel, his legacy continued. Like his mentor, Orel too had been forced to leave the Agricultural University in 1949 due to his support of Mendelian ideas but he remained undeterred in continuing Kříženecký’s ambition of rehabilitating Mendel in the Communist Bloc, and finally on the first evening of an International Symposium held in Brno in 1965 to celebrate the centenary of Mendel’s paper the ceremonial opening took place of the Mendelianum, a museum dedicated to Mendel’s work which became a meeting place for scientists on both sides of the Iron Curtain. By this time Lysenko had fallen from favour but he had left a toxic legacy. Thanks to his interest in Mendel, his contact with Western scientists and the Catholic Church, Orel remained under surveillance by the Czech authorities who held a file on him until 1989. Nor, in a rather ironic twist, did the collapse of Communism bring an end to his troubles – for as the Berlin Wall fell he now found himself being accused by former colleagues at the Mendelianum of having collaborated with the Communist authorities. According to Orel, in their tireless efforts to rehabilitate Mendel in the countries of Eastern Europe that had fallen under the spell of Lysenko, he and Kříženecký were guided by important questions that had first been posed by R.A. Fisher in 1936: What did Mendel discover and how did he come to his discovery? These questions continue to be debated vigorously amongst historians today, but as the case of Kříženecký and Orel shows, it is a debate which has had repercussions far beyond academia. After all their long years of hard work to rehabilitate Mendel, Kříženecký and Orel would no doubt have been delighted to learn that last year a new statue was dedicated to Mendel in Brno by Professor Greg Radick of the BSHS and that the Mendel Museum there intends to publish a print edition of the new BSHS translation of Mendel’s paper – a project which was itself inspired by Orel when he encouraged Professor Staffan Mueller-Wille to undertake this piece of work. But what might Mendel himself have made of these accolades? As a modest man he would probably have been flattered but bewildered that his experiments on peas could have earned him these honours. But he would probably have been even more bewildered – and saddened – had he known that in his name, scientists such as Kříženecký and Orel, and many others had endured such hardships. I would like to express my thanks to Professor Staffan-Mueller Wille, University of Exeter and Professor Greg Radick, University of Leeds for invaluable comments and advice with this piece, and Dr. Amir Teicher, Tel Aviv University, for kindly sharing his work in preparation. Bachrach, S. (2004) ‘Deadly Medicine: Creating the Master Race’ published by the United States Holocaust Memorial Museum, University of North Carolina Press. Bateson, W. (1902) ‘Mendel’s Principles of Heredity: a Defence’, Cambridge. de Beer, Sir Gavin (1965) ‘Genetics: the Centre of Science” Proceedings of the Royal Society of London, 164: 154-166. Fisher, R.A. (1936) ‘Has Mendel’s Work Been Rediscovered?’ Annals of Science, 1: 115-137. Ings, S. (2016) ‘Stalin and the Scientists: A History of Triumph and Tragedy 1905-1953‘. Faber and Faber. Joravsky, D (1970) ‘The Lysenko Affair’. Cambridge Mass, Harvard University Press. Kampourakis, K. (2015) ‘Myth 16: That Gregor Mendel was a lonely pioneer of genetics, being ahead of his time’. In R. L. Numbers and K. Kampourakis (Eds.). Newton’s Apple and Other Myths about Science. Cambridge MA: Harvard University Press, 129-138. Olby, R. (1979) ‘Mendel – no Mendelian?’ History of Science 17 pp.53-72. Orel, V. (1992) ‘Jaroslav Kříženecký (1896-1964), Tragic Victim of Lysenkoism in Czechoslovakia’. The Quarterly Review of Biology, 67: 487-494. Paleček, P. (2016) ‘Vítĕslav Orel (1926-2015): Gregor Mendel’s biographer and the rehabilitation of genetics in the Communist Bloc’. History and Philosophy of the Life Sciences, 38. Radick, G. (2005) ‘Other Histories, Other Biologies’ in ‘Philosophy, Biology and Life’, ed. Anthony O’Hear. Cambridge, Cambridge University Press; pp.21-47. Radick, G. (2016) ‘Presidential Address: Experimenting with the Scientific Past’, British Journal for the History of Science, 49: 155-172. Radick, G. (2016) ‘Teach Students the Biology of their Time’, Nature, 533, p.293. Soyfer, VN (1994) ‘Lysenko and the Tragedy of Soviet Science’. Translated by Leo Gruliow and Rebecca Gruliow. New Brunswick NJ, Rutgers University Press. Teicher, A. Social Mendelism: Genetics and the Politics of Racial Anxiety in Germany, 1900-1948, manuscript in preparation. Bowler, P. (1989) ‘The Mendelian Revolution: the Emergence of Concepts of Heredity in Modern Science and Society’. Johns Hopkins University Press. Brannigan, A. (1979) ‘The Reification of Mendel’, Social Studies of Science, 9: 423-454. Fairbanks, D.J. and Abbot, S. (2016) ‘Darwin’s Influence on Mendel: Evidence from a New Translation of Mendel’s Paper’, Genetics, 204: 401-405. Gliboff, S. (1999) ‘Gregor Mendel and the Laws of Evolution’, History of Science, 37: 217-235. Guilfoile, P. (1997) ‘Wrinkled Peas & White-Eyed Fruit Flies: The Molecular Basis of Two Classical Genetic Traits’, The American Biology teacher, 59: 92-95. Hartl, D.L. & Orel, V. (1992) ‘What Did Gregor Mendel Think He Discovered?’, Genetics, 131: 245-253. Muller-Wille, S., & Orel, V. (2007) ‘From Linnaean Species to Mendelian Factors: Elements of Hybridism, 1751-1870.’ Annals of Science, 64: 171-215. Muller-Wille, S. (2007). ‘Hybrids, pure cultures, and pure lines: from nineteenth-century biology to twentieth-century genetics.’ Studies in the History and Philosophy of Biological and Biomedical Sciences, 38: 796-806. Olby, R.C. (1966) ‘Origins of Mendelism’. Schocken Books, New York. Olby, R.C. (1987) ‘William Bateson’s Introduction of Mendelism to England: A Reassessment’, British Journal of the History of Science, 20: 399-420. Orel, V. (1966) ‘Gregor Mendel: The First Geneticist’, Oxford University Press. Portin, P., & Wilkins, A. (2017). ‘The Evolving Definition of the Term “Gene”. Genetics, 205: 1353-1364. Radick, G. (2011) ‘Physics in the Galtonian Sciences of Heredity’, Studies in History and Philosophy of Biological and Biomedical Sciences, 42: 129-138. Radick, G. (2015) ‘Beyond the “Mendel-Fisher” Controversy’, Science, 350: 159-160. Sapp, J. (1990) ‘The Nine Lives of Gregor Mendel’, in ‘Experimental Inquiries’, ed. H.E. LeGrand (Kluwer Academic Publishers), pp.137-166. Stern, C., & Sherwood, E.R. (1966) The Origins of Genetics: A Mendel Source Book. San Francisco & London: Freeman & Co. The above photo shows the unveiling of the new statue to Mendel in Brno in 2017. 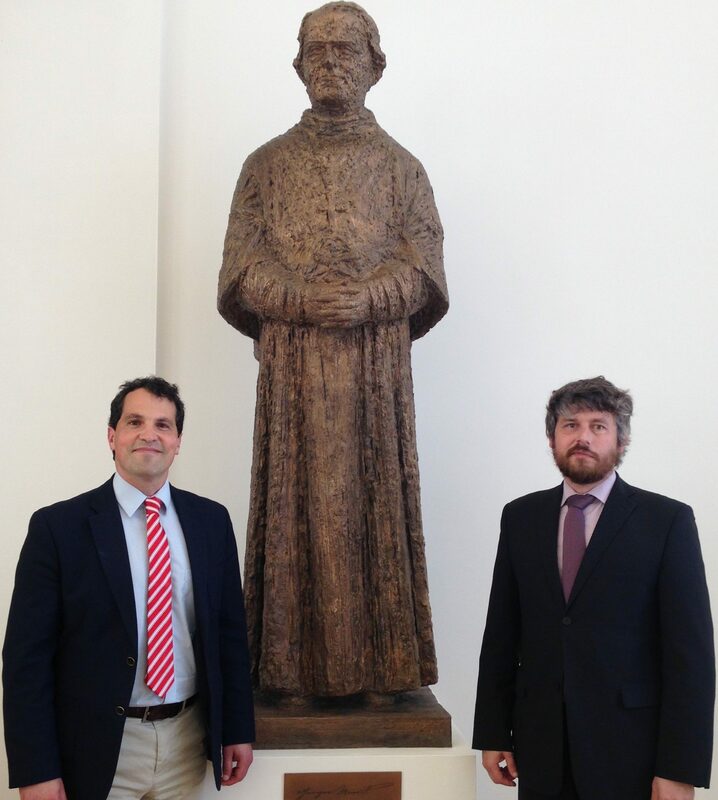 Professor Greg Radick is pictured with Dr. Ondrej Dostal, Director of the Mendel Museum in Brno.